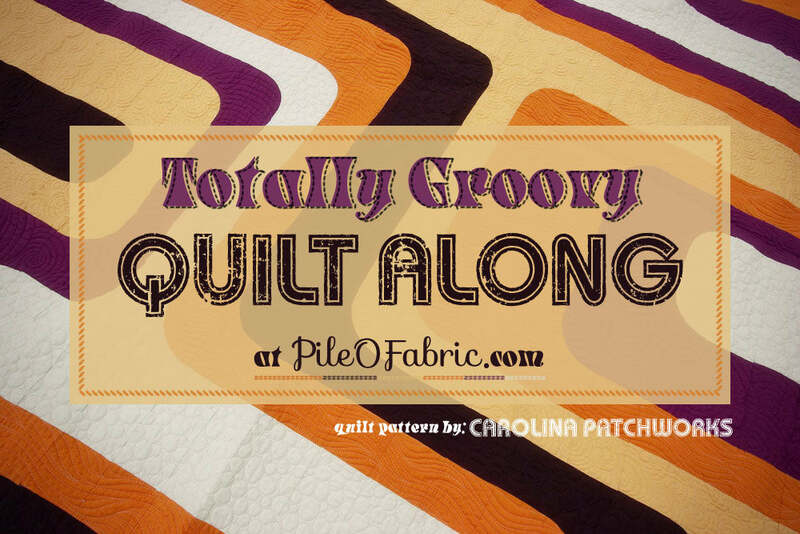 Also, my quilt guild has a new facebook page. Feel free to "like" us to see what's happening. Here's two more present blocks for my local quilt guild. This pic looks kinda funny... the colors aren't true. This pic was taken on my kitchen table at 4:30am or so with not the best lighting. My part was just adding all those little points with the pink background. BUT check back in October to see what the whole quilt looks like. You will be amazed! Yeah! another Friday Night Sew In successfully completed. Check out what the others did here. As for the FNSI (Friday Night Sew In) I plan on working on two modern minis that I have to get out by next week. I just need to add borders to each. One has many many many pieces in it. The other will probably be a simple border. Regardless, I am hoping they are done by this weekend! I'm not sure how to show a pic of my progress on the mini's without spoiling it for anybody. I'll probably just zoom in and do sneak peeks. Happy sewing everybody! Here's my two 3-D Flower blocks for the September Block Lotto. I think I'll stop at two this month because I have so much to do on my niece's baby quilt. She was due YESTERDAY! Completed four challenge Bows and Boughs blocks for my local quilt guild. This pattern was a web bonus at McCallsQuilting.com from November/December 2011. You can find the free pattern here. I made an Ohio Star block for our local quilt quild. I finished quilting my Tetris quilt!!! Yeah! Completed my Tetris QA quilt -- quilted and all! Started a facebook page for my local quilt guild! Made one Ohio Star block for my local quilt guild. Here's a block I finished today. It's the 3-D Flower for the September Block Lotto. Every few months my local quilt guild has a challenge in which someone decides what quilt to make. Blocks are made accoding to the pattern of that choice. Each block made receives an extra chance to win the finished quilt top. This time we are doing bows and boughs blocks. This pattern was a web bonus at McCallsQuilting.com from November/December 2011. You can find the free pattern here. 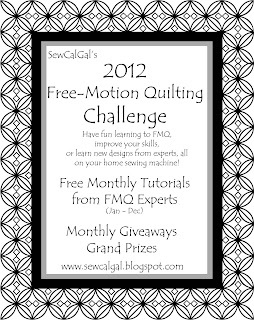 The winner of this quilt top will then choose which quilt blocks will be made for the next quilt. This person also supplies the pattern and/or block suggestion and some of the fabric. Here's the Ohio star I made this weekend for our local quilt guild. Tetris QA - Friday Finish! Whohoo! Happy dance, happy dance! My Tetris quilt is done. I really wanted it done for the quilt parade, but I'm still very happy with today's finish. Thanks, Melissa, of Happy Quilting for leading us in such a do-able quiltalong. Check out Melissa's blog here. My quilt finished 60" x 80". So I LOVE this sunflower Debbie Mumm fabric border. But can you believe that I won it in a Fugly Fabric giveaway? Thanks, Lisa, from In the Boon Docks! You can see her blog here: http://intheboondocks.blogspot.com/2012/05/fugly-giveaway.html But that's not all. Look at the other things I won on her blog that I used for the back! These panels worked out great. Thanks, so much, Lisa! Here's one of my favorite parts. I made a 3D sunflower with using sort of prairie points for the petals of a sunflower for my quilt label. I like it! You might even win a yard of fabric from Fat Quarter Shop! Here's the block that I made for my partner, Sherry from NJ, for the September Block Swap Adventure. Sherry requested a paper pinwheel block from Quilter's Cache (see pattern here. ) She wanted cream background with a bright colored paper pinwheel. I think she will like this. It was mailed on 9/5/12. Happy National Sewing Month, Sherry! Here's the awesome August block that I received from my partner, Karen in OR. I requested a churndash block. LOVE it! Thanks, Karen. I'm excited to report that I finished my Hundred Hugs Quilt. 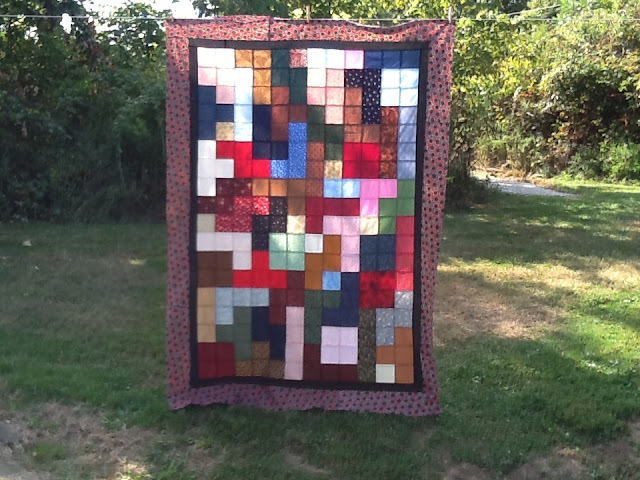 What a fun way to get rid of a few of those 2.5" squares and half squares made with my Accuquilt GO! Baby. Here's where you can find the original pattern! Aren't these pics from the site cute? I like how the flower petal design makes a secondary circle pattern. I am also working on my healthy diet and active lifestyle. If you are looking for motivational and healthy tips, like my friend's page on facebook. She works at the local YMCA with me and is very cool. Completed 24 rows of the tumbler charm quilt. I finished the Tetris QA quilt top. I really want to get this one quilted by 9/10 to make it to the Tetris quilt parade on Melissa's blog (Happy Quilting). I worked for what seemed like all day on the pieced back for this quilt. Hopefully I'll have pictures of the pieced back soon. Tetris quilt parade needs to be turned in 9/10! Mailed 9 Block Lotto blocks to the winners -- Congrats to all! My niece's due date got bumped up to 9/16 instead of the original 9/27... The OSU fabric colors have been cut, I have sewn three rows together. Whoopee... Gotta get cracking on this one too. August was such a success to complete my Just 3 goals. 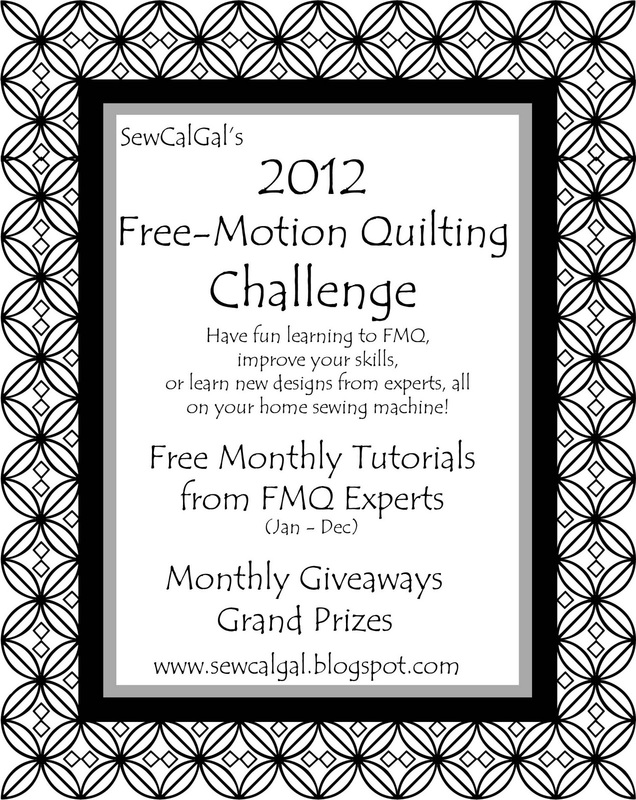 In this Challenge you pick three quilting things you want to finish by the end of the month. Then you link up with traceyjay quilts the first week of the following month and show your progress. You can see my completed three August goals on Sunday's post to my blog here. Here's my September goals to link up with traceyjay quilts for the Just 3 Challenge. September #3 goal is kinda small considering I have two quilt tops to finish this month. Link up now at traceyjay quilts. You never know what you will accomplish! Complete seven more rows of the Tumbler Charm quilt. This includes going through my scraps, cutting more tumblers, and adding them to the quilt. Right now it is at 17 rows. This will still not complete the quilt top, but it will still be making progress. But there is still a ways to go on it (but just a little). What are your goals for September? Set Just 3 and link them at traceyjay quilts. There is a Spring Fling giveaway at Quilt Block Swap Australia, the lovely Sue is giving away a Cameo jelly roll to members and followers. Check it out!